The MC-909 has been the heart of my studio for some time now. I am usually of the mind that “all in one” solutions are inferior to a combination of a few well-chosen pieces that each excel at one task. But in this case, it really can do it all if you need it to. If you’ve used the previous entries in the MC groovebox series and didn’t like them, don’t let that make up your mind about the 909. Among the new features it brings to the MC line are onboard sampling with expandable memory, velocity sensitive pads, individual outputs, expandable waveform ROM and a huge screen to make the menu diving a bit easier to handle. The sound is also top notch, employing the same XV engine as the Fantom series. Let’s start off with the sampling. It is integrated rather well into the synth engine and anything you sample can be used as a waveform in any of the four-tone patches (more on this below). Drum kits can also use a mix of sampled hits and onboard drum sounds. Getting your samples into the 909 is fairly simple with the ability to import/export via USB or by Smartmedia. Or, if you’d rather use the inputs, there’s an area in the upper right with a red background and this is where you will find the sample button along with all of the sample editing features. You choose whether you want to sample external audio or re-sample. From there, you decide which input you want to sample from (1/4″ stereo, digital, digital coax), whether you want auto triggering to be active, stereo or mono and how long you want to sample for. And that’s pretty much it. It’s very handy to be able to set the length as a number of measures if you know the BPM of the incoming signal or if you’re re-sampling. Once your sample is created, you go to a nice big waveform thanks to the huge screen. You set start, end and loop points, truncate if needed and then edit sample properties to decide if it’s a loop, gate sample, one shot or plays in reverse. It is at this point that you probably want to make sure you name and save your sample. The 16mb in the user area doesn’t last very long so I recommend putting only samples there that fall into the “bread and butter” category. For me, some amen break samples, as I use those a lot. A good habit to get into is saving everything (samples, patches, patterns and drum kits) to the Smartmedia card. This will save you the headache of figuring out where each element of each pattern is located, which is important because if anything changes, each pattern that depends on that item will change. Other considerations about sampling on the 909? Well, the auto chop feature is extremely easy to use with the big screen. As soon as you finish chopping something, you are given the option to create a rhythm kit from the slices of the sample and you also have the choice of whether to assign it to the currently selected part or not. You are able to assign slices to any rhythm kit at any time and that brings me to an important point: You always want to name and save your sample before you chop it. If you don’t, you will create a bunch of generically named slices (“SampleXXXX”) and it will be impossible to find what you want later on. But if I name my sample “Amen Break,” for example, the 909 will name the slices “Amen Break 01” etc. Much easier to work with. Another tip, unless you think you might want to undo it, is to always check the “Overwrite” box when you use the edit functions on a sample. Otherwise you may end up with several copies by the time you are done truncating, normalizing and timestretching. Ok, moving on to the synthesis engine and the interface that drives it. As stated earlier, you have four tones (or, oscillators, if you prefer) to a patch. You can use onboard waveforms, samples or waves from the optional SRX board if you have one installed, or any combination of the three. Each tone can be subjected to rather deep editing. The most common functions (filter, LFO, pitch, amp, envelopes) do have a knob or slider right on the face of the machine. For more obscure functions, you just hit the edit button and you have everything in front of you on the big screen, only a button press or two away. Now, you can edit all four tones at once, one at a time or any combination of the four. The key to keeping this straight is to simply get used to using the four tone buttons. Activate editing for the one or ones you want and make your changes. When talking about gear, you’ll often hear the phrase “You’ll get out of it what you put into it” and that is very true with the 909. If you just want basic synthesis, you can do that. But if you want to get into cross modulation, unique LFO waveforms, different signal paths, velocity layered drums or patches, etc., you can do it on here and everything can be done per tone for some incredibly detailed sound design. You decide how deep you want to go and the engine will not disappoint. One of the really cool things you can do is import single cycle waveforms and use those as material for your sounds. The 909 is right up there with the best when it comes to handling these microscopic snippets of sound and it means that you can never run out of fresh sounds. You can even join a bunch of these waves together into a sample that is a few seconds long and sweep through the waveform using the “Sample Machine Gun” feature. Couple that with the effects and you can get some crazy sounds. It’s kind of like having a (very primitive) wavetable synth onboard. As for drums, all of the same things apply. You can meticulously edit each sound in a drum kit and even use velocity layers to change things up. One negative here is that you only get 16 sounds per drum kit. It would be nice if you could have 128 like the RS-7000 and I’m not sure why, in 2003, this limitation was necessary. Anyway, there are a ton of onboard drum kits comprised of 909 and 808 kits, genre specific kits, percussion only kits and even kits made up of weird one shot sounds and, for the most part, they sound really good. But if you get bored of them, just make your own. That’s probably the best part of working with the 909, in my opinion. And, though they are called rhythm kits, you certainly don’t have to use them for drum kits. For example, if you’re remixing a track, just take a long sample of the material you want to use, chop it and make a kit where each pad is a different section of the original song. In this way, you’re only taking up one of your 16 parts for all of those chunks of the song. And now, the heart of any groovebox, the sequencer. It’s pretty standard but performs well. One thing that you should know is that the 16 tracks are tied to the corresponding midi channel. Another is that all parts have the same length. If you want an alternative that doesn’t have these limitations, I emphatically recommend the RS-7000 and I will do a sort of “head to head” for these two in a future post. In any case, the sequencer runs at 480ppqn but you can also quantize down to 32nd notes. You have a highly customizable arpeggiator that can be quantized as well so that you always start your phrase right on time. Though I find the sequencer to be the weakest part of the 909 (as opposed to sampling, synthesis, interface), it does have one function that will blow your mind once you realize what it is actually capable of: the RPS/pattern set section. With pattern sets, you can assign an entire pattern to each key and use trigger it at will. Likewise, with the RPS feature, you can you assign each pad a single part of any pattern and jam out. Just think about how great this would be in a live setting. Have all of your “stems” assigned to RPS sets beforehand and trigger them live (with quantization if you need to) and mix and match between patterns. Play them however you want. This also applies to midi tracks so, if you have a whole stack of external gear, you can trigger them effortlessly. Beats the hell out of pushing play on a laptop and I’m sure your audience will thank you for that. So there you have it, my thoughts on the MC-909. I haven’t mentioned a lot of negative things here and that is because I honestly don’t feel there is that much negative. I’ve tried other similar machines too in an effort to find the absolute best choice for my workflow. ASR-X, RS-7000, hell, Ableton live. And after all that, this is the one I still own. Granted, I do plan on buying an RS-7000 again in the future, but I just feel that the 909 edges it out for me. But I would never discourage anyone from buying the RS, as it is also an amazing piece of kit. 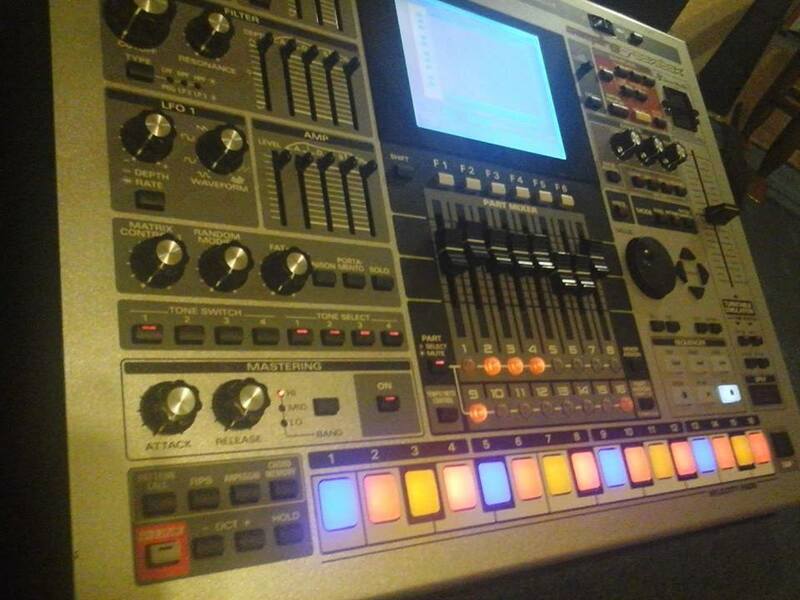 What I always say is that you buy the RS for the better sequencer and the 909 for better sounds and sampling. That is not to say the 909 is perfect. If you Google around a little bit, you will find some bugs that people have encountered that may very well be dealbreakers for you. Funny thing is, I have never been affected by most of them, so I won’t go over them here. Bottom line, a maxed out MC-909 with working velocity pads these days should run you maybe $450-500. Add another $100 or so for an SRX board of your choice (I recommend the SRX-05 Supreme Dance card) and you have a formiddable machine that will work just as hard as you are willing to work. What are your thoughts on the MC 909 versus the MC 80 wait… Have you ever tried it? I know the features set is very similar (with the mc-808 having much more polyphony)… But there are trade-offs with the display in the motorized faders, etc. I think your thoughts on a comparison between these two would be invaluable . Unfortunately, I’ve never had a chance to try the MC-808, so my thoughts on it must be taken with a grain of salt. It seems to me that it would make a great sound module, what with the extra polyphony and all. But what always kept me from purchasing one is that it *seems* like you would really need to connect to a PC to get the most out of it. I loved the 909 because the big screen and abundance of knobs made it really easy to delve into the rather deep sound engine and it just seems to me that the small display on the 808 would drive me nuts because there are sooo many parameters in the engine that these two share. But I imagine that, once you get all of your patches set up, the 808 would be great to jam on. But with the low prices on the MC-808, I may yet pick one up one of these days, just to see. I can definitely see how using the faders for editing could be pretty slick once you get used to doing it. And I do know a couple of people who swear by it, so I’m sure it can’t be nearly as tedious as I expect. I have had the 909 for a number of years. I mainly have been using it for adding synths and electronic beats splicing rap and rock together or just making beats completely from scratch to sell. I have not even begun to use it as a sampler because I mainly sample from records if I am going in that direction with a track and just using my DAW (cubase 8.5) and moving things around in there if need be. I recently started doing some research and it looks like this was initially meant for making techno and mainly dance music. Are there any recommendations for me in my particular situation? I am debating on getting rid of it.